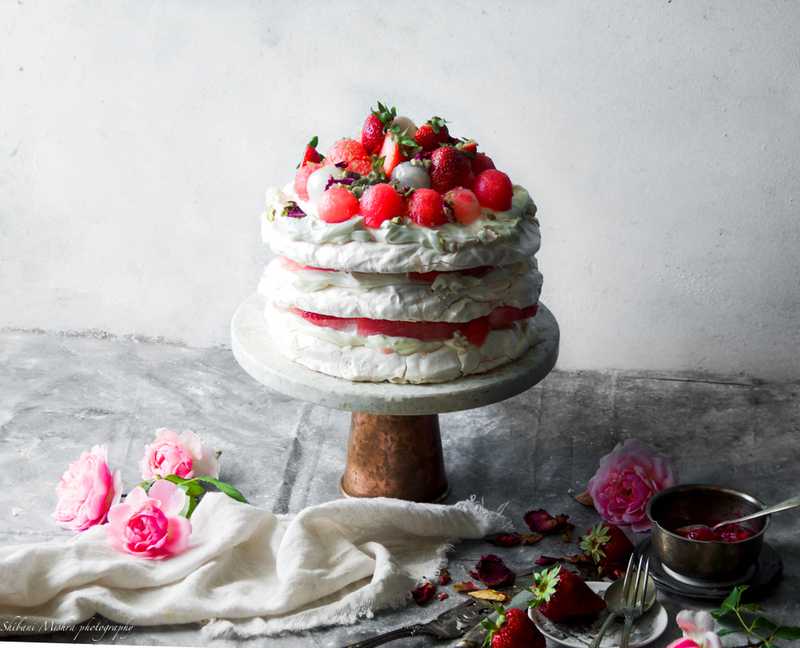 This Rosewater pavlova is definitely a favourite of mine and, the combination of strawberries and watermelon infused with rosewater is an absolute must—this Rose water pavlova dessert is not just for the palate, it’s for the soul, something to be made with love for a very special occasion.”. 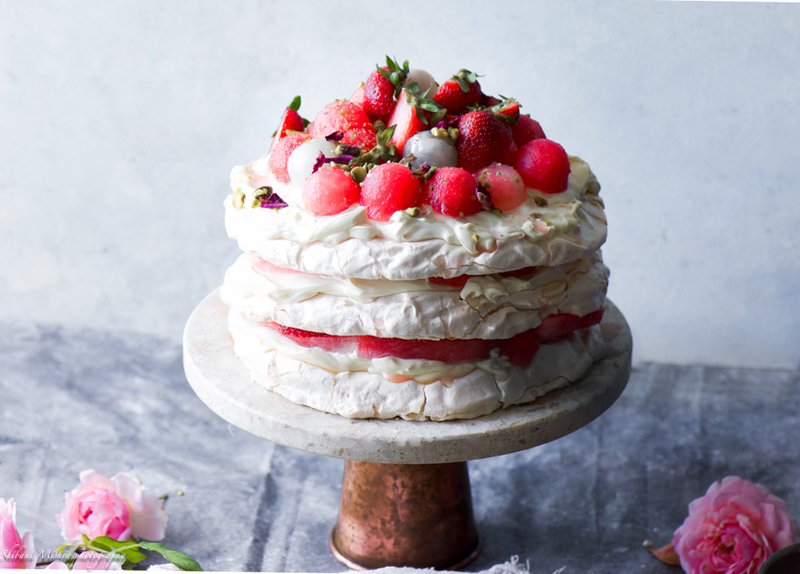 Baking pavlova was something new for me and ever since I have discovered pavlova several years ago it brought my adoration to new heights. 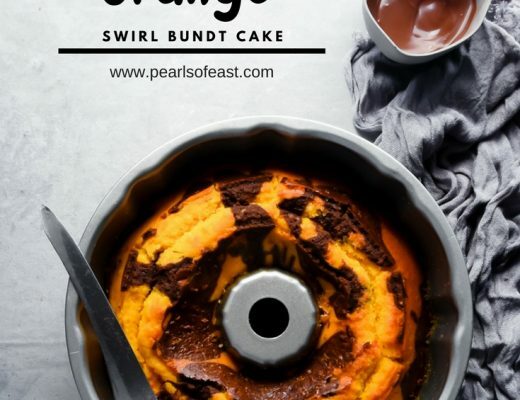 This is a recipe I have fallen in love with it. As I sit down to update my blog with the very last post of this year, I pat myself for running along this incredible journey so far. This year has been kind to me in many aspects. 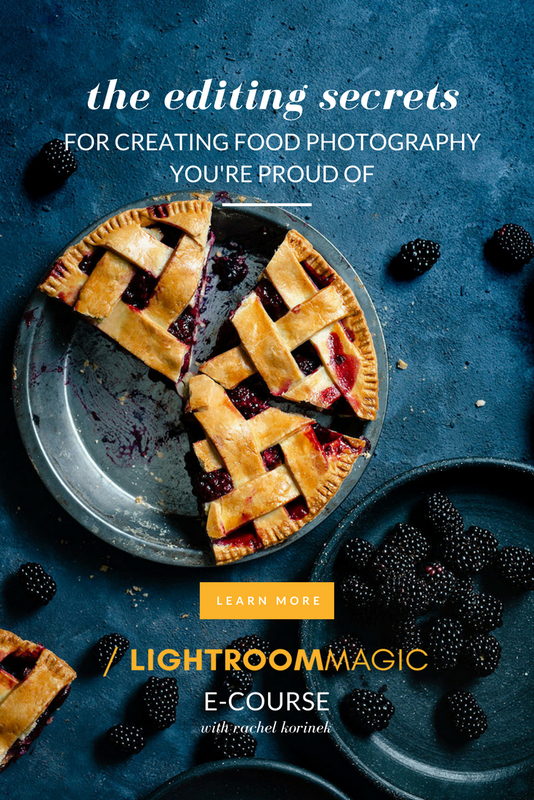 Professionally I have put my foot down and taken a plunge into the core aspect of the photography business and on personal side, it has been quite good too. 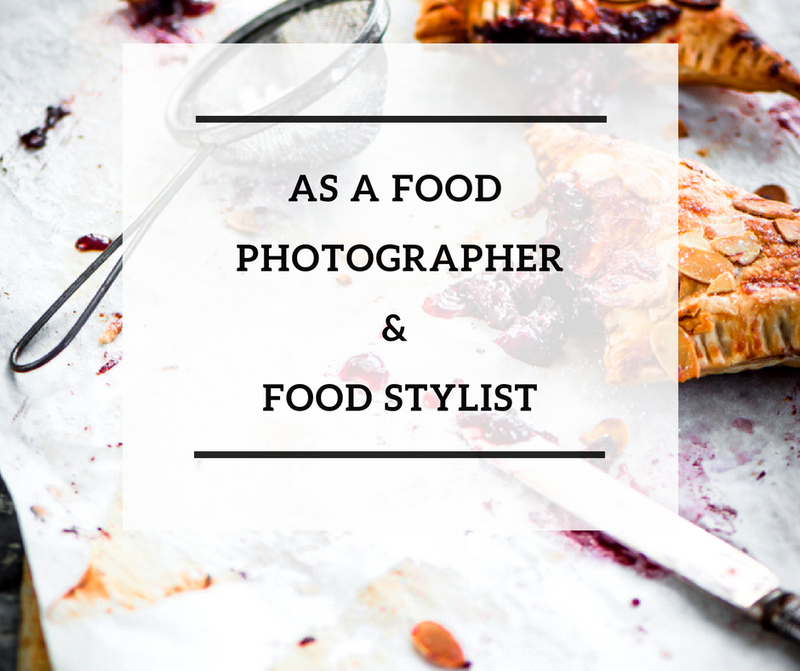 I am happy with what I have at the moment and do hope that this coming year will be more exciting for me in terms of my professional career as a freelance photographer and stylist. 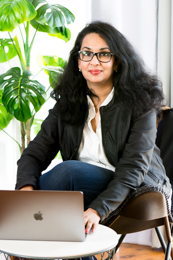 Thanks to blogging world that basically opened the doors for me. Now I am taking a break at the moment and heading off to India for summer holidays. So this space will not be updated for a month at least. I am sure I will be coming back with new recipes and ideas soon to make it more exciting for you all. Since school holidays have already begun and the boys were at home enjoying and relaxing. I thought of baking few goodies before we pack off for our holidays. 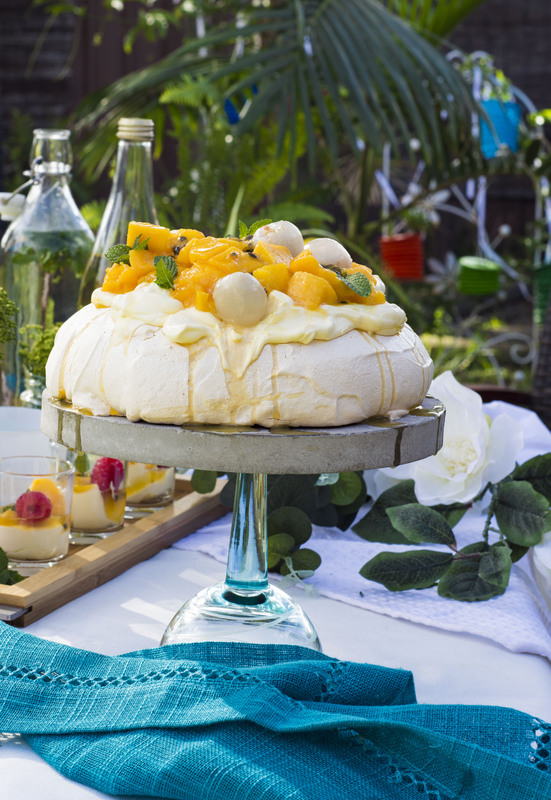 Pavlova is one of our favourite dessert. 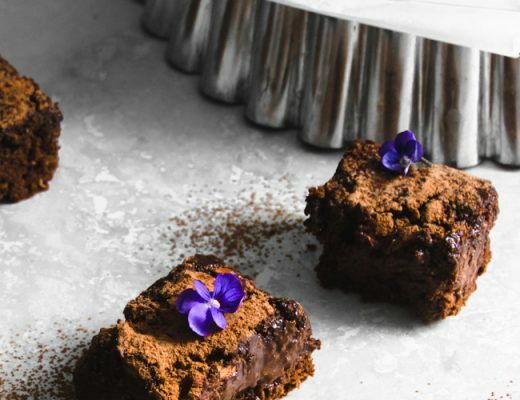 Every time I bake this classic dessert, I have seen the boys finish it off with in few minutes. This time I made a great twist to its flavour by adding few drops of rose water to the meringue. Also the three tier has its own charm too. 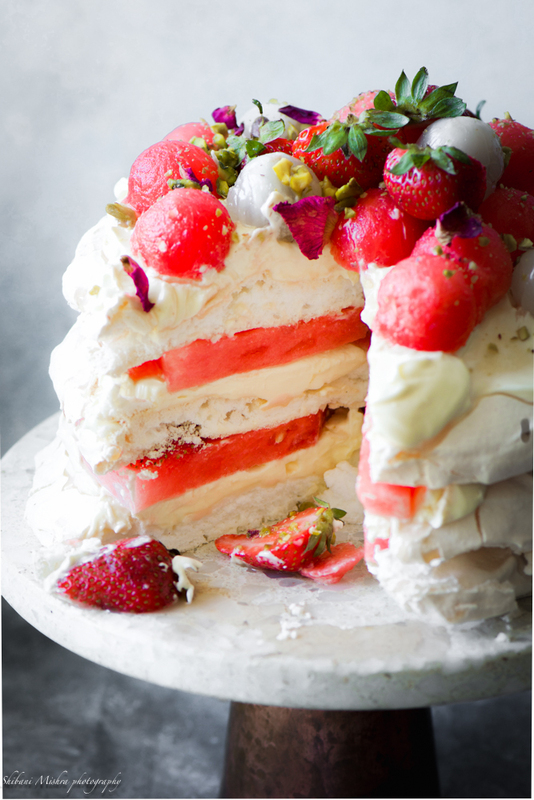 Now if you are from Sydney and you must be familiar with a famous cake from black swan pastry that has created its name by selling an unique cake with an extremely unique combination, watermelon and strawberry infused with rosewater. Believe me when these fillings were part of the Rose water pavlova, it was heavenly. The combination of rosewater, double cream and layers of watermelon and strawberries and few dried rose petals turned out be absolutely fabulous. 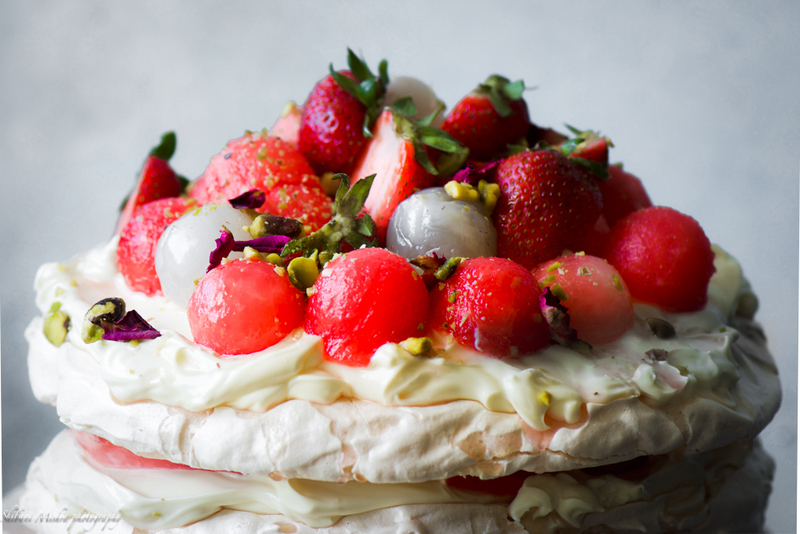 I have the basic pavlova recipe in my blog archives. I have used the same recipe for creating three bases instead of one giant base. I have simultaneously used two baking tray in the oven for making three bases. Preheat oven to 220″C. position oven shelf near the bottom of the oven. Draw three 7 inch circles onto a sheet of baking paper and place face down onto a baking tray. Using a large mixing bowl, Beat egg whites and cream of tarter on a medium speed until light and foamy. 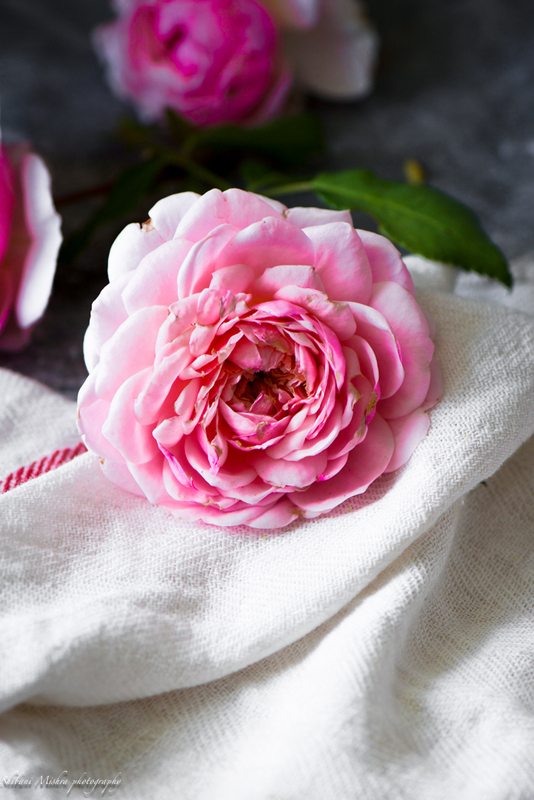 Fold through rosewater. Spoon mixture onto paper to cover circles Using a palette knife, smooth side and top. Place into oven and reduce heat to 120 “C. Cook for 1 hour 15 minutes. Turn off oven and prop open oven door with a towel or wooden spoon.Allow the pavlova to cool down slowly for 4 to 5 hours or overnight preferably. Arrange melon on a wire rack in a single layer, sprinkle with 1 tablespoon rosewater and 2 tablespoons sugar, then stand for 30 minutes for flavours to infuse. Whisk the cream. Add the remaining 1 tablespoon rosewater and whisk until soft peaks. 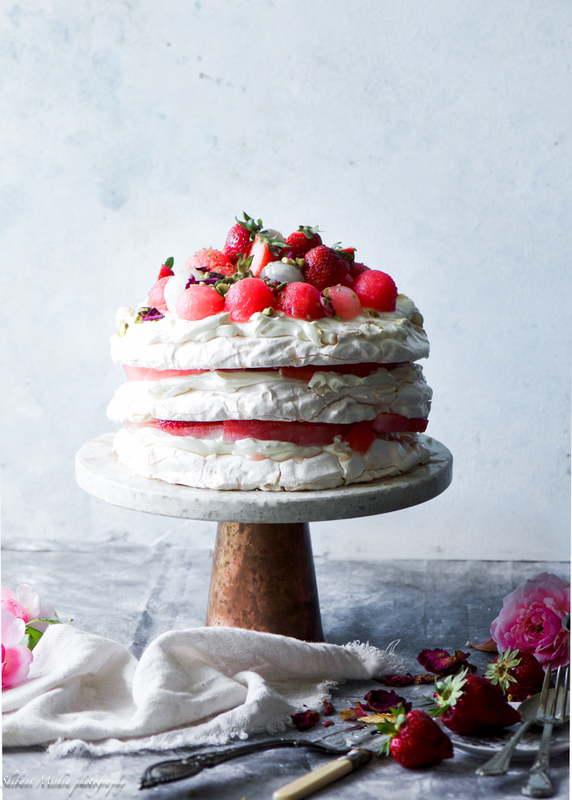 Place one pavlova disc on a serving plate and sprinkle with a little extra rosewater. Spread over one-third of the cream, top with half the watermelon. Repeat layers, then top with a final layer of disc and cream. 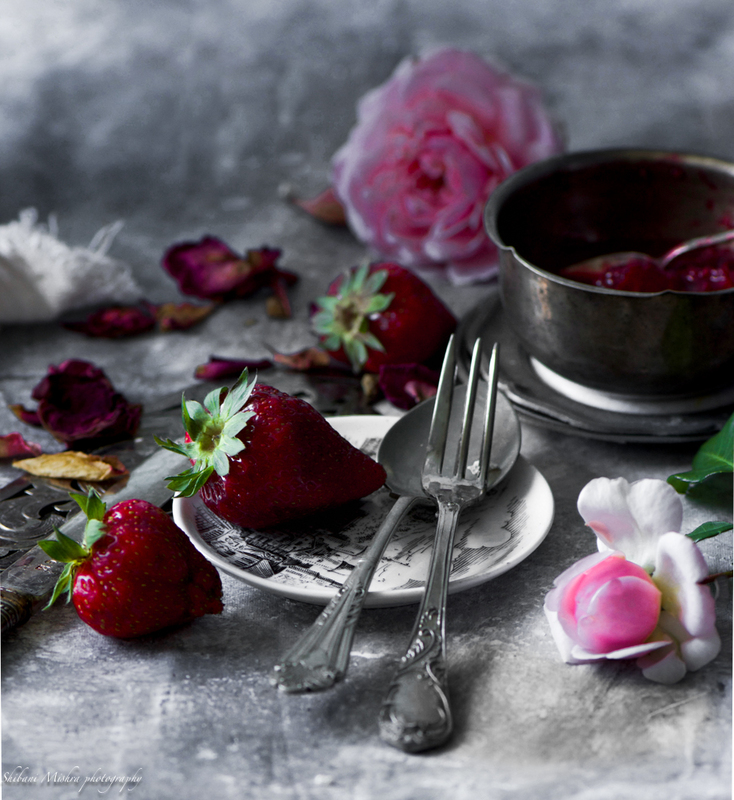 Arrange lychees, watermelon balls and strawberries into the cream, then garnish with pistachios and dried rose petals. Note - I have used double cream so skipped the sugar altogether. 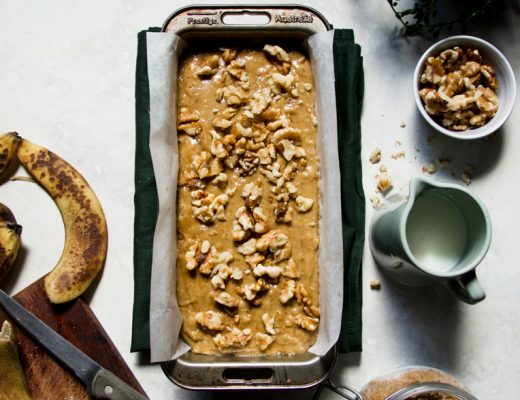 Now if you are using thickened cream,Whisk the cream with 2 tablespoons of sugar with electric beaters until thickened. Add 1 tablespoon of rosewater and whisk until soft peaks. 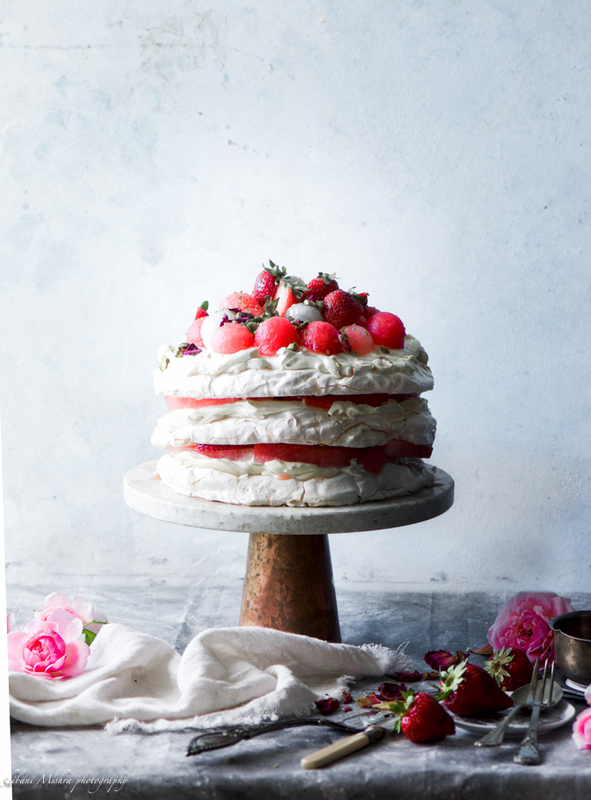 If you bake this gorgeous Rose water pavlova, don’t forget to tag me. Love to hear from you.